You're still going to get hit in the crotch, but now it'll be captured on a GoPro. Recon Instruments and Empire Paintball's paintball mask is fun to wear — and I didn't even get to shoot anyone. The Empire EVS houses Recon's Snow2 heads-up display in bottom-right of the goggles, running on Android, with nine-axis sensors, Bluetooth, WiFi and GPS, while the helmet itself looks like a color-saturated Darth Vader pretender -- and I mean that in the best possible way. Slipping into it is easy, and an armband control unit with directional buttons makes navigation through menus (as well as zooming in and out of maps) hard to screw up. 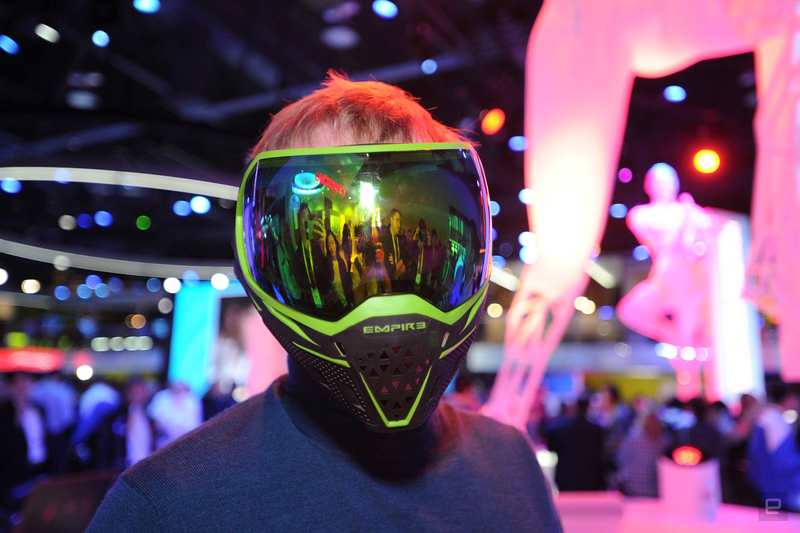 The mask itself, coming from paintball equipment maker Empire has UVA/UVB radiation protection and doesn't fog up inside when the action picks up and your breathing gets heavy. 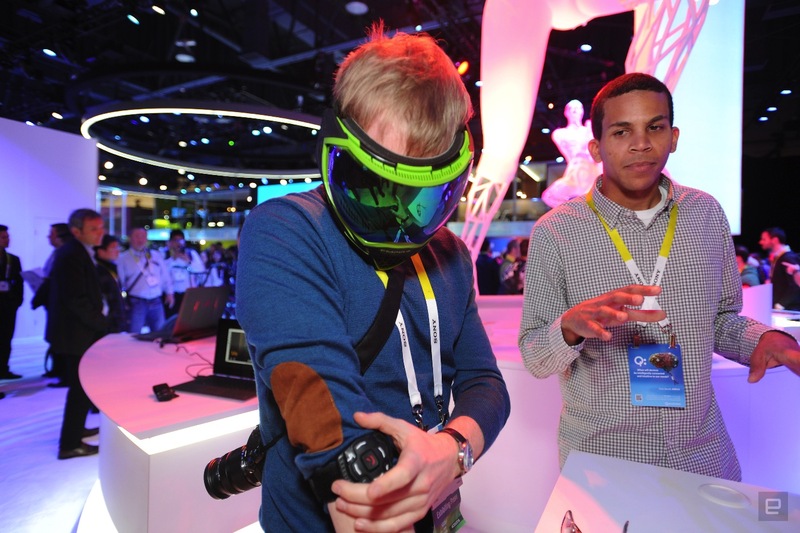 The heads-up display (HUD) can also talk with action cams like the GoPro, which you can mount on your paintball gun to peek around corners and, as one Engadget editor calls it: "cheat". The working prototype (the mask is going into production this year), detected my own head movement, rotating my location tracker on the preloaded map of the Las Vegas Convention Center. The allows your allies to be tagged on the maps as well, bringing all those hours of Halo, CoD or your competitive shooter choice. Inside our demo headset, we could see our (fictitious) brothers in arms and other points of interest. The cool part is that there's a lot potential to introduce different ways of playing paintball if the mask gains traction... and with Empire Paintball manufacturing it, it stands a chance. Maybe now we have a chance against the robots.